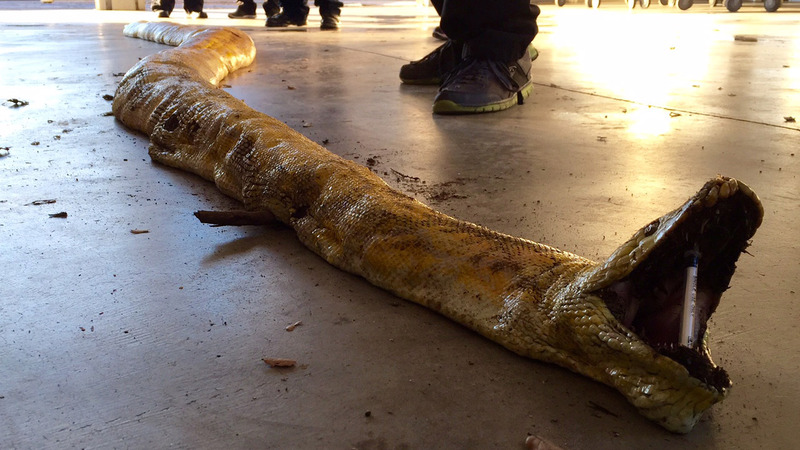 JURUPA VALLEY, CA -- A more than 17-foot Burmese python was found dead at a Jurupa Valley dump sorting facility Tuesday afternoon. Riverside County Animal Services received a call from Burrtec Waste Industries on reports of workers finding a snake's body in one of the loads. Animal Control Officer Christopher Peck arrived at the materials recovery facility and found the albino Burmese python was already dead. The reptile was measured at 17 feet 7 inches long. Authorities said it would be hard to determine the cause of death, but believe it likely died of natural causes and the pet owner illegally dumped it. Riverside County Animal Control Services would properly dispose of the reptile's body.